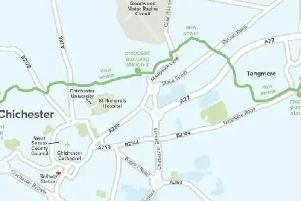 A revised Chichester local plan setting out where 650 new homes a year will be built is set to be published for consultation next month. Back in July, 2015, Chichester District Council (CDC) adopted a planning framework for the period 2014-2029, excluding the area covered by the South Downs National Park Authority. The strategy allocated new housing and employment sites. The planning inspector scrutinising the local plan expected a review to be completed within five years by July 2020. This review has been ongoing since 2016 as the council looks to put together an extensive evidence base. A full local plan review has now been prepared in draft. This sets out CDC’s preferred approach for planning policies up to 2035 and is set to be considered by cabinet members on Wednesday (November 14) and would then go before all councillors the week after. If approved, the document would go out to public consultation for eight weeks, starting in mid-December. Susan Taylor, cabinet member for planning at CDC, said: “Our current local plan was approved by a Government planning inspector in 2015, on the basis that we agreed to review it again within five years. “This was because the inspector felt that we would need to accommodate more housing in the long term. From 2016 to 2035, the plan makes provision for 12,350 new homes, equating to 650 dwellings a year. This is made up of 609 homes a year to meet the area’s objectively assessed housing need and 41 per year to meet the unmet need in the Chichester district’s part of the national park. A number of key sites for development are included in the preferred approach document: a minimum of 1,600 homes west of Chichester – 350 more than the adopted local plan – and six hectares of employment land, at least 585 dwellings on land at Shopwyke, which is 85 more than the adopted plan, with four hectares of employment land, 600 homes east of Chichester, 350 units at the Southern Gateway, 100 homes and employment on land south west of Chichester, 250 dwellings at Highgrove Farm, Bosham, 250 units at North Park Farm, Selsey and a minimum of 1,300 homes on land west of Tangmere, which would be an extra 300 above the allocated in the adopted local plan. Meanwhile, a minimum of 2,500 homes would be provided on strategic sites through neighbourhood plans. Schemes include a minimum of 500 homes in the Chidham and Hambrook parish, at least 350 dwellings in the East Wittering parish, a minimum of 250 homes in Fishbourne, at least 200 homes in Hunston and a minimum of 1,250 units in the Southbourne parish. The plan also sets out a number of smaller parish housing requirements where there is no strategic allocation. It is anticipated that the land will be identified in neighbourhood plans for those parishes. More than 230,000 square metres of new employment floorspace is also allocated. Around 2.4 hectares of employment land would be provided on land at Chichester Business Park in Tangmere. The council has commissioned a transport study to look at the impact development will have on the road network and suggest measures to mitigate this impact. This will be available alongside the preferred approach and includes work to the A27 Chichester bypass junctions. This is separate to proposals that have been the subject of consultation by Highways England and discussion by the Build A Better A27 group recently.